Founded by Katie Barber and Joe Lye, Albion Stores in the seaside town of Margate specialises in contemporary clothing and accessories. 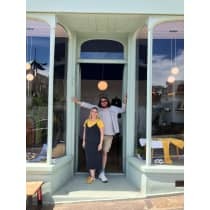 Shopkeepers by day and DJs by night, Katie and Joe are passionate about sourcing the coolest contemporary brands for their customers, introducing them to amazing craftspeople and designers they may not have otherwise encountered. "Our shop focus is on up-and-coming British designers, but we also stock music from our favourite independent record labels as we are both DJs and music is a very important part of our lives. It’s actually how we met!"